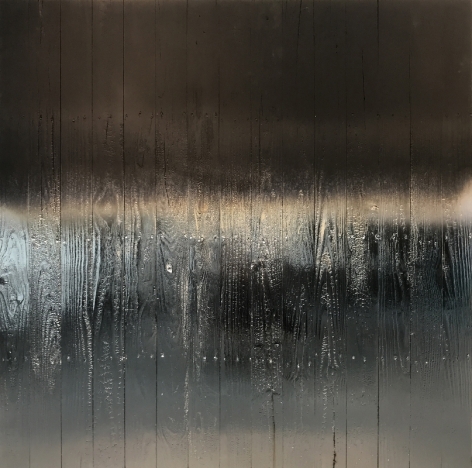 We are pleased to present Drifting Cloud, Flowing Water, an exhibition of new paintings on metal and sculptural wooden installations by New York-based artist Miya Ando. This exhibition is a continuation of the artist’s ongoing exploration into concepts of time and transformation. 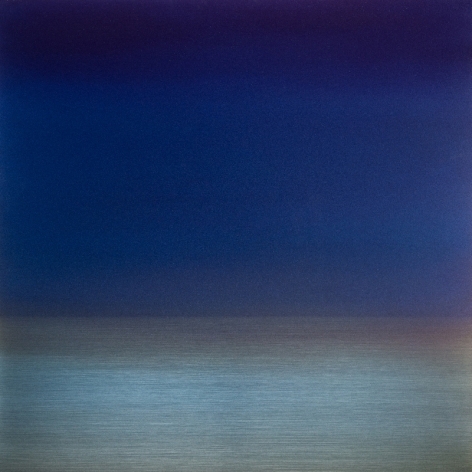 Ando, who is best known for her sublime metal paintings in luminous gradients of color, is a practicing Buddhist who infuses her work with her spiritual beliefs and focuses on the interconnectivity between artwork and viewer. Embodying concepts of both ephemerality and permanence, Ando’s work is meant to be experiential, compelling the audience to interact, to move around and view the work from different angles. By doing so, the viewer experiences the works in multiple ways. As the light changes throughout the day, the perception of the paintings change, creating a heightened awareness of the present moment, however fleeting. 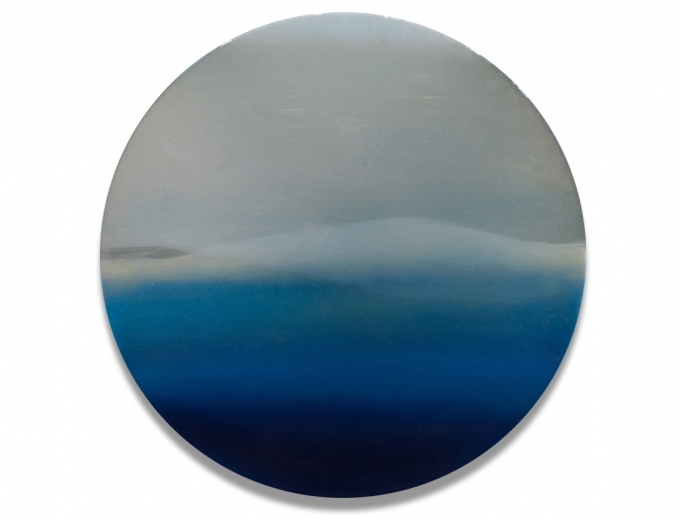 This idea is perhaps best exemplified in Ando’s Kumo (Cloud) paintings, which inspired the show’s title, Drifting Cloud, Flowing Water, a phrase derived from a Zen poem describing the transient lifestyle of itinerant monks. 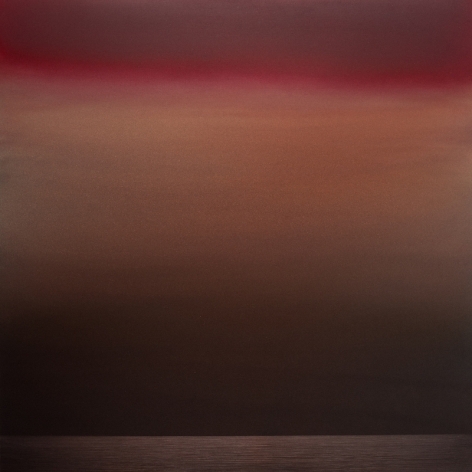 The Kumo paintings allude to evanescence, such as clouds shifting from one moment to the next, subtly marking the passage of time. 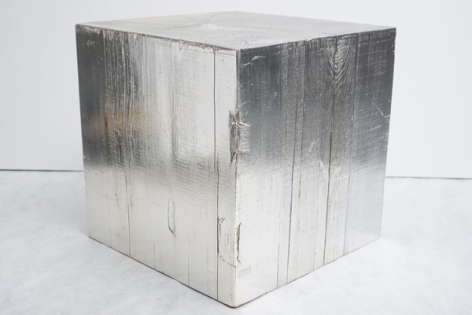 As with many of her works, Ando expresses this concept with industrial materials. For these paintings, she uses brushed aluminum composite as a canvas, the subtle texture of which compounds the mercurial quality of light. 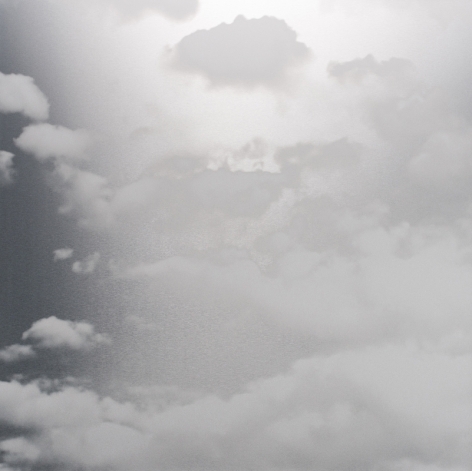 The clouds are rendered with matte ink, which gives the overall effect of light emanating only from the negative space—the metal surface—in the same way that light radiates from the sky. 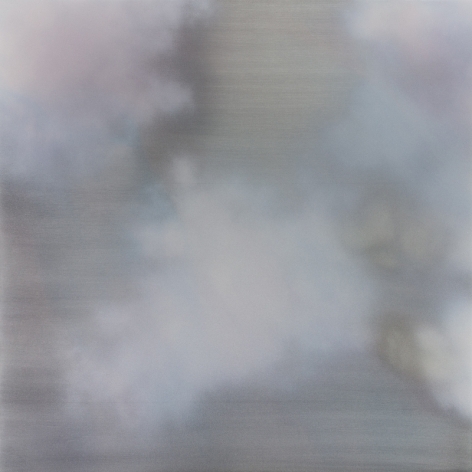 Cloud 6 (Kumo), one of the early paintings from this series, was recently on view in Atmosphere in Japanese Painting at the Los Angeles County Museum of Art and acquired for the museum’s permanent collection. Ando’s newest series of paintings, Yoake (Dawn), echoes the concept of the Kumo works, but with more evidence of the artist’s hand. 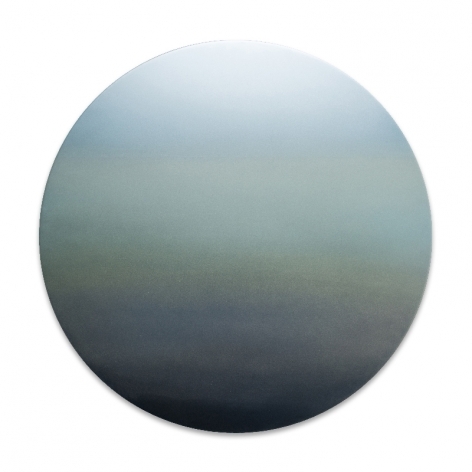 Produced on aluminum panel using hand-mixed pigment, urethane and resin, Ando applies translucent layers of soft, pastel color with a delicate touch, creating subtle shifts in tone to lend depth and space. Rather then creating a dichotomy between subject and medium, the effect seamlessly blends the permanence of metal with the ephemerality of the natural world. 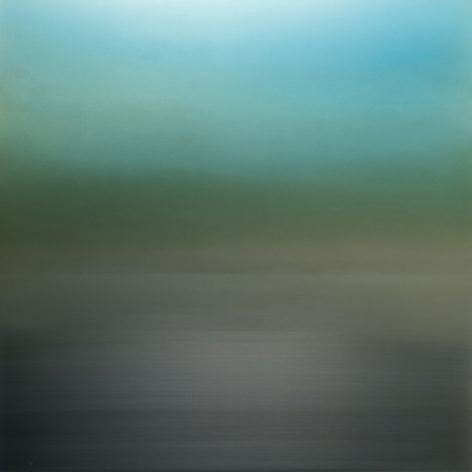 The Kasumi (Mist) series, which Ando began in 2015, also draws from the transience of nature. The newest paintings in this series, rendered in a lush palette of muted pinks, peaches and golds along with rich reds, blues and greens, have evolved to become more painterly. 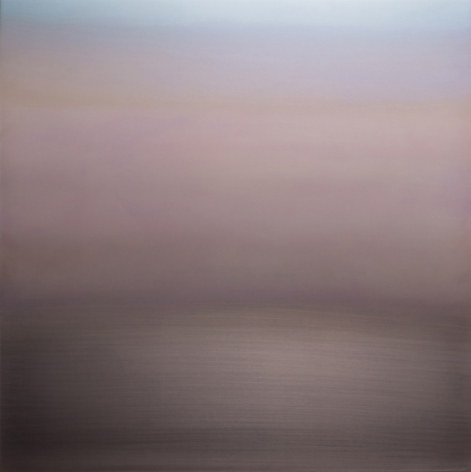 Previously, colors were segmented into distinctive fields; now Ando softly blends one color into the next, inspired by the mutable atmospheric condition the title suggests. This series includes several large-scale paintings, with some measuring up to 8 feet wide. 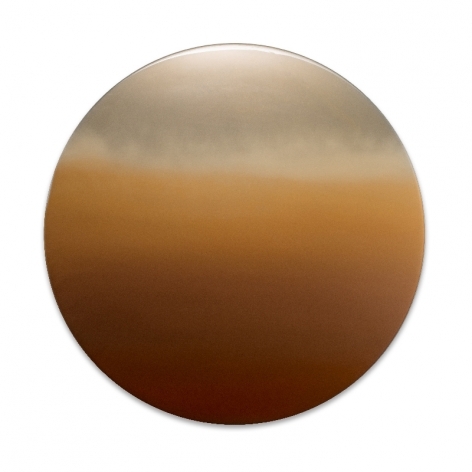 In addition to metal paintings, pieces from Ando’s new Alchemy series will be on view. These sculptural works in wood embody Ando’s central theme of transformation of materials, but in a different way. For this series, Ando created a distinctive technique of coating wood in silver nitrate, a chemical compound used by alchemists as far back as the 13th century. After undergoing the process, the wood’s texture and history are permanently fixed in silver. Every groove, burl and knot reflects light, amplifying its natural beauty. Ando first applied the technique to rough-hewn cubes of felled redwood from California, where she lived after spending her early years in Japan. These works were prominently featured at the Cornell Art Museum, Florida, in the recent exhibition Looking Glass. Ando has also created several wall-mounted pieces, where the primary medium is charred wood, an homage to shou sugi ban or yakisugi, a traditional Japanese architectural material used as fire-resistant cladding. Ando used this material in earlier works, including for her large-scale installation Emptiness the Sky (Shou-Sugi-Ban), part of Frontiers Reimagined, a collateral event of the 56th Venice Biennale in 2015. Ando’s work has been shown worldwide, including recent solo shows at the Hammond Museum, North Salem, New York, and the SCAD Museum of Art, Savannah, Georgia. Her work has also been exhibited at the de Saisset Museum, Santa Clara University, California, in a show curated by Nat Trotman of the Guggenheim Museum, and in an exhibition at the Queens Museum, New York. Ando has also produced numerous public commissions, most notably a thirty-foot-tall sculpture in London built from World Trade Center steel to mark the ten-year anniversary of 9/11, for which she was nominated for a DARC Award in Best Light Art Installation. Ando is the recipient of the Pollock-Krasner Foundation Grant, 2012.